In American horse racing, the middle of July heralds the opening of the Saratoga Race Meet in Saratoga Springs, upstate New York. Held on the iconic grounds that have been hosting racing for 150 years, if good weather and marquis races prevail, it's possible that the meet's attendance could exceed 900,000 fans. Let's face it, not everyone is able to get to the Spa. If you can't be trackside at Saratoga, the virtual venues of the digital age, television, books and DVDs can all bring Saratoga to you. 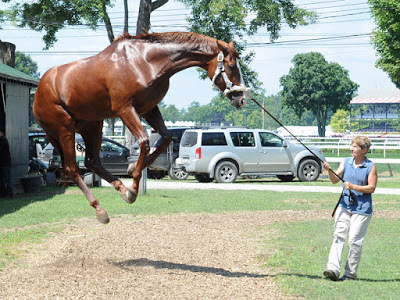 For daily updates and the kind of insight you can only get from boots-on horsemen, Joe and Sean Clancy's the Saratoga Special is the way to go. The New York Times' Joe Drape's missives range from eyebrow raising investigations to personal "post cards" from Saratoga. Local turf scribes Nick Kling from the Troy Record and Mike MacAdam of the Schenectady Daily Gazette handicap and share their trenchant insights. The Saratogian, the Albany Times-Union, and the Blood Horse offer a variety of Saratoga coverage. Unless you are a subscriber, most of the Daily Racing Form's coverage is behind a paywall; Steve Crist's daily blog from the Spa is an exception. America's Best Racing aggregates Saratoga news from across the digital platform. To catch the moment-by-moment, play-by-play of track goings-on, Twitter is my social media of choice. Joe and Sean Clancy, Drape, Kling and MacAdam opine on Twitter as well. For some fun, @SaratogaGoose is witty, well-connected and horse-smart! Adam Mooshian and Barbara Livingston post superb photos of racing and the backstretch. Interested in history? Watch The Track at Saratoga, a lush documentary celebrating 150 years of racing that's showing on July 31 on PBS channel WMHT. And because it's Saratoga, where Secretariat had great wins and a stunning loss to Onion in the Travers, beg, borrow or buy Penny & Red: The Life of Secretariat's Owner. This documentary relates the compelling stories behind the legend of Secretariat. Mrs. Tweedy is candid, charming and full of surprises. Via Google, you can travel back to the Saratoga musings of sportwriters Red Smith and Joe Palmer, or cruise the vaults of Sports Illustrated, or even better, the New Yorker. For fiction, contemporary author Natalie Reinert 's Other People's Horses, is a romp with horses, trainers, horses, owners, more horses and Saratoga. Reinert's previous life as a racetracker is fertile fodder for her writing; her characters are so well wrought, they leave you guessing who's who in real life! A schedule of major races will be broadcast live, every weekend in August (see below). NBC, NBCSN and Fox Sports will showcase the top horses running for millions of dollars in purses. The NBC races are win-and-you're-in challenges to qualify for a berth at the sport's year end championships at Santa Anita Park, The Breeders' Cup. Finally, if visiting Saratoga is not in your cards, if you're not going to have lunch on the Terrace, or squeeze into a boxseat next to a blueblood or billionaire, or grab a breakfast beer on the backstretch, remember this: a smidgen of Saratoga is better than no Saratoga at all.